Mesothelioma caregiver burnout is a state of physical, mental and emotional exhaustion felt by people who provide care to a mesothelioma patient. Burnout is common among mesothelioma caregivers, and there are ways to manage it. Caregiver burnout is caused by too much long-term stress. It can develop if caregivers don’t get enough help and don’t take enough breaks. Caregivers who are burned out often experience extreme fatigue, irritability, anxiety and depression. Their attitude may change from hopeful and caring to hopeless and overwhelmed. Knowing the signs of burnout can help mesothelioma caregivers recognize when they need to take steps to address it. A 2011 report by the UCLA Center for Health Policy Research found caregivers experience higher levels of psychological distress than noncaregivers. Caregivers are also more likely to engage in poor health-related behaviors such as smoking. The report said middle-aged caregivers may be at the greatest risk for poor health outcomes such as high blood pressure, heart disease and diabetes. This could affect adult children of mesothelioma patients who take on a caregiving role midlife. In 2011, the American Psychological Association published a report on stress in the U.S. It reported caregivers experience higher levels of stress than the general population, believe they do a poor job of managing and preventing stress, and perceive themselves to be in poor health. How Can I Reduce My Stress as a Caregiver? Respite care is one of the best ways to provide relief for a primary caregiver. This kind of care is available at home and in respite care centers. Insurance benefits, VA benefits and state agencies may help cover the cost of respite care. Home health services provide nurses and home health aides for short-term care. Additionally, private care aides are professionals who specialize in assessing needs and coordinating care. Caregiver statistics show 35 percent of female caregivers handle the most difficult caregiving duties, such as toileting, bathing and dressing, compared to 24 percent of male caregivers, who tend to help with financial planning and other less difficult tasks. Divvying up the most difficult duties among primary and secondary caregivers reduces stress. It is best for caregivers to shoulder burdens as equally as possible. This approach is important to apply when offering end-of-life care to a loved one with mesothelioma. Understanding the causes of caregiver burnout, also known as caregiver stress syndrome, can help caregivers pinpoint areas where they need help. Neglecting Your Own Health and Needs: Caregivers can become so busy caring for someone else that they forget to take care of themselves. It becomes easy to neglect your own health and needs when you feel so focused on someone else’s. Make sure to schedule time for self-care and relaxation. Ask a friend to check in on you weekly. Role Changes: Becoming a caregiver often involves changes in roles. A spouse caring for their partner or a child caring for their parent may experience stress as they take on difficult caregiving duties. It takes time to adjust to role changes. Talking to a mental health therapist or a close friend about your feelings may help. Unrealistic Expectations: Many caregivers put in a lot of effort and expect their help to have a positive impact on their loved one. Sometimes caregivers experience stress when their loved one doesn’t get better after all the work they’ve put in. Caregivers must learn to accept what is out of their control. Meeting with a grief counselor may help. Unreasonable Demands: It is common for primary caregivers to take on too many responsibilities. They may set unreasonable demands on themselves that contribute to stress. Ask a family member or friend to take on some caregiving duties to lessen your load. 'Lean on Me' Can Help You Cope with Your Loved One's Diagnosis. 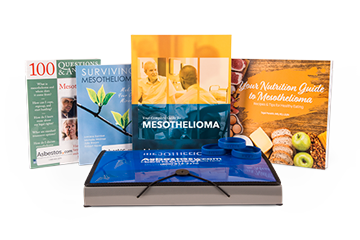 Get your free must-read mesothelioma books mailed to you overnight! How Long Does Caregiver Burnout Last? Caregiver burnout will last until the caregiver gets adequate help and rest. Working with a mental health professional, such as a therapist, grief counselor or social worker, can help you identify the steps you can take to recover from burnout. Taking time and space to process your emotions will help. Try to find ways to relieve stress and decompress. They may include exercising or watching your favorite TV show. After the loss of a loved one, it is common for caregivers to experience grief months or years later. This is called delayed grief. When a person is struggling to handle a stressful situation, it is normal to feel numb to stress, loss and grief. Often, these feelings surface once the stressful circumstance has passed, when we finally feel like we have time and room to breathe again. Delayed grief is complicated by caregiver burnout. The effects of caregiver burnout can linger for months or years, contributing to the delay. Talk about your feelings on a regular basis with someone you trust. Accept that you can’t do it all alone, and open up to help from others. Set realistic goals, and don’t overwork yourself. Join a caregiver support group to find others who can relate to you. Schedule time for self-care and activities you enjoy. Schedule respite care to ensure a full break from caregiving. Work with a mental health professional to develop new coping methods and relaxation techniques. Promote your health by eating well, exercising regularly and developing good sleep hygiene. Institute for Quality and Efficiency in Health Care. (2006). Depression: What is burnout? Cleveland Clinic. (n.d.). Caregiving: Recognizing Burnout. Family Caregiver Alliance. (2016). Caregiver Statistics: Demographics. Hoffman, G.J. & Mendez-Luck, C.A. (2011, September). Stressed and Strapped: Caregivers in California. APA. (2011). Stress in America: Our Health at Risk. Scott, P.S. (n.d.). How to Beat Caregiver Stress Syndrome and Stay Healthy. American Heart Association. (2015). What Is Caregiver Burnout? AARP. (2015, June). Caregiving in the U.S.
Schulz, R. & Sherwood, P.R. (2009). Physical and Mental Health Effects of Family Caregiving.